TeamSupport gives you the ability to create a customer feedback loop, which gives you valuable insight into the satisfaction of your customers. 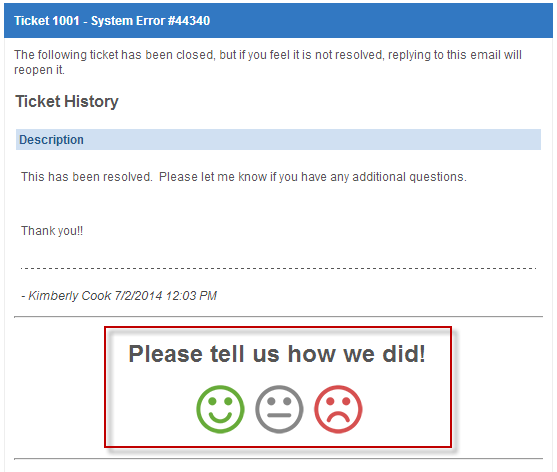 *Please note: If you signed up for TeamSupport after June 28, 2014, Ratings will be pre-configured in your account. For customers who had an active account on or before June 28, 2014, setup is required. TeamSupport can send out an email to your customers after a ticket is closed to ask them to rate their Customer Support experience. 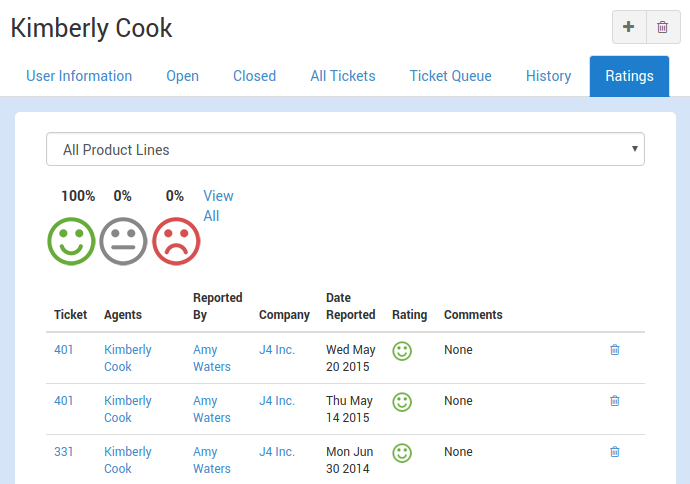 The rating will be applied to all users who added a visible (public) action to the ticket. You can write custom reports for your Ratings. Click here to learn how to create a custom report. You can use rating as a condition in Ticket Automation. For example, you can post a shout out on Water Cooler when your team receives a positive rating. To view ratings for a user, click on their “Ratings” tab in the User section. Each rating for the selected user will be listed on a separate line with the Ticket Number, Agent(s) who added a visible action on the ticket, the Customer who reported the rating, their Company association, Date reported, Rating (Happy, Neutral, or Unhappy), and an optional comment. To view all ratings, click the “View All” link, or you can filter the results by rating type by clicking on the icon. Additionally, you may filter the ratings based on the Product Line that was selected on the ticket by choosing a Product Line from the drop down menu. Your user rights apply to which Product Lines you may have available to you. In addition to viewing the ratings in the User section, you can also view all of the ratings a particular customer has left by viewing the Ratings tab in the Customer section. Click here to learn how to setup Ratings.